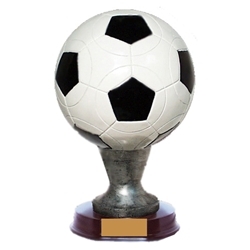 15" Large Soccer Ball Resin Trophy. An affordable alternative to a metal award. Great look at a great price. Wonderful coach or MVP gift. We now have an option to replace the base shown with a taller/larger wood base (use option box to select). This makes it perfect for a Perpetual Award or to make a bigger statement. With optional Wood Base total height is 18".